During a visit of Spoleto and its surroundings, you can not miss a stop in the fortified village of Campello Sul Clitunno, located at just 10 km from the city of Spoleto. What to see in this place outside the classic tourist circuits? Although it is very small, Campello is primarily known for the particularity of its historic city center, still today completely enclosed by massive walls, and especially for the area linked to its sources. The Sources of Clitunno have been well-known for the past eras and were an inspiration for many poets and writers who passed in Spoleto and enjoyed the beauty of the place, a true natural oasis. Adjacent to the Sources, very important is also the Early Christian Tempietto of Clitunno, included in the list of UNESCO World Heritage Sites. What to see in Campello sul Clitunno in one day? 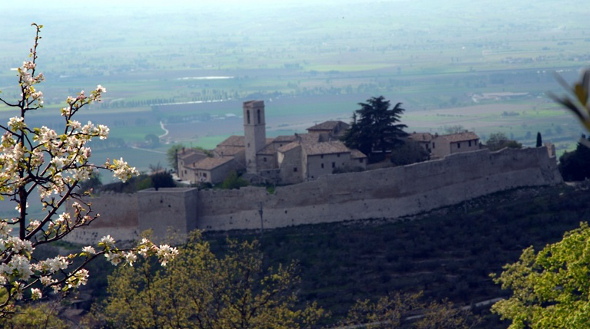 After the initial overview, find out more about what to visit at Campello and near Spoleto. 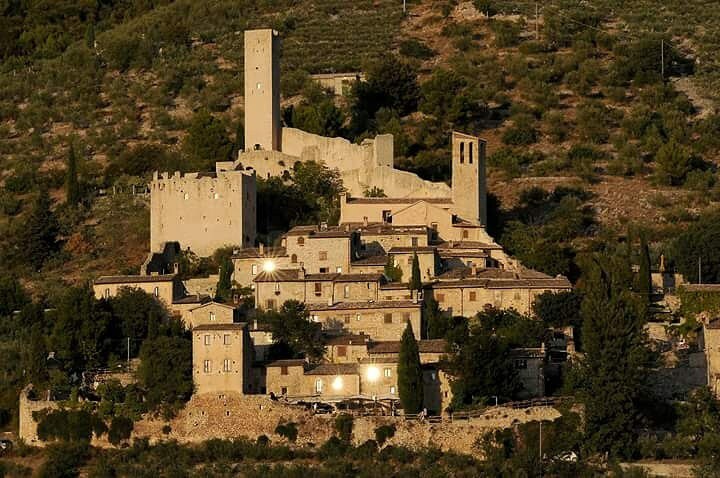 The village is composed by two differentiated areas: Campello Alto, the fortified village developed around the Castle, and Campello Basso, where the Church of Madonna della Bianca is located. The Castle, built in the 10th-11th century by the Baron of Borgogna Rovero of Champeaux, still saves its walls intact. A single door marks the access to the village, where there is the Church of Saint Donato with a fine wooden baroque altar, the Palazzo Comunale and, nearby, the monastic complex of the Barnabites, inside which are preserved a Madonna of Spain and a Giotto fresco, Crocefissione e Santi, from the 15th century. The Church of Madonna della Bianca, erected in 1516 with the ecclesiastical authorization of the bishop of Spoleto Francesco Eroli, was initially named "Madonna del Soccorso", then "Madonna della Misericordia" and finally "Madonna della Bianca", to distinguish it from "La Bruna" (near from Castel Ritaldi) and from "La Rossa" (Pietrarossa). The building has a Latin cross structure surmounted by a dome, a magnificent stone portal and two frescoes of Spain inside. Restored in 1797 on a design by Valadier, those of the emerging neoclassical taste were superimposed on Renaissance elements. The true jewel of this territory is represented by the Sources of Clitunno, excellent destination for a trip out of town and for those looking for a bit of refreshment from the summer heat. 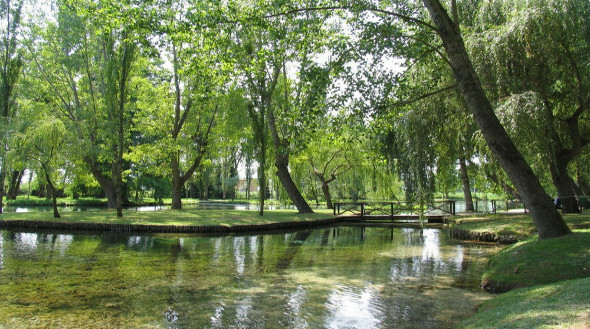 The crystal clear water, fed by underground springs, is surrounded by a dense vegetation of weeping willows and poplars that give the environment a charming and romantic atmosphere. 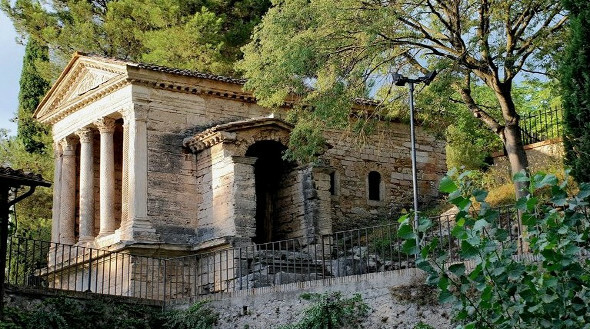 Not far from the sources there's the church of San Salvatore better known as the Tempietto del Clitunno, a small temple-shaped shrine of early Christian origin, consisting of a small cell preceded by a classic pronaos. Listed on the UNESCO World Heritage List in the "Longobardi in Italy" circuit, the small temple testifies the presence of the Longobard civilization in Italy between 568 and 774 AD. and it is among the most ancient examples of sacred Umbrian art. What to do in Campello sul Clitunno? Even this ancient Umbrian village is part of the City of Oil Association: excellent reason to take advantage of a visit to the mills scattered in the surrounding countryside and taste excellent bruschetta combined with the best local products. Entirely mountainous, the Municipality of Campello acts as a link between the Valle Spoletina and Valnerina. In this territory you will have the opportunity to admire high peaks, green valleys, beautiful forests of oaks and beech and small stone villages perched, such as Acera, Agliano, Pettino, where there is a mountain shelter that supports hiking on the nearby Mount Serano. 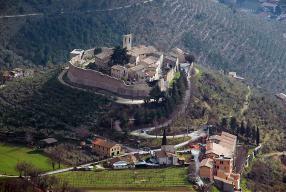 In the surroundings it is worth visiting the castle of Pissignano, one of the hamlets of Campello. Built on a slope around the ninth century, it has a typical triangular structure and still preserves intact the perimeter of its walls intercalated by powerful polygonal towers and two door towers. The intermediate pentagonal tower, initially created with defensive functions, was then used as a bell tower of the church of San Benedetto, an integral part of the architectural complex that belonged to the Benedictine community. Inside you can see paintings and frescoes from various eras. Walking in the open air, playing sports, watching all the processing processes necessary for the production of the precious extra virgin olive oil, wandering through the alleys of the historic villages ... could have made you feel a little peckish! What to eat then in Campello, according to the local gastronomic tradition? 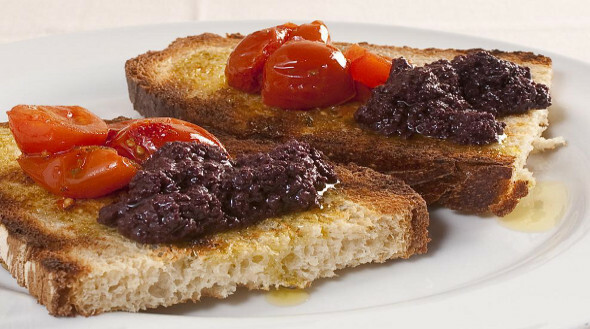 In the antipasti you can not miss the trio of bruschetta: the classic one with EVO oil, the one with black or green olives patè and the one with truffles. For lovers of seafood, try the crayfish and the grilled trout with truffle sauce, true delicacies for the palate that are some of the most typical dishes of local restaurants. Discover the best restaurants of the area of Campello sul Clitunno, perfect to taste the local specialities!